Meathead Movers is here to take care of the heavy lifting for you on your move to Walnut Creek Movers. Our clean-cut student athlete movers are ready to get you safely settled into your new Walnut Creek Movers home. Located just 16 miles east of downtown Oakland, Walnut Creek is a great community to live and work in. Walnut Creek is home to a vibrant arts scene with several arts programs, theaters, and galleries. In fact, the city also hosts the California Symphony. Because Walnut Creek is a part of the larger San Francisco Bay Area, its residents get to enjoy all the extensive entertainment, dining, sightseeing, and retail opportunities this metropolitan area offers. Whether you are moving to Walnut Creek for a job or for a change of pace in your lifestyle, be sure to check out how easy Meathead Movers can make your move. One of the Meathead differences is in the quality of movers we hire. Unlike other Walnut Creek movers, we don’t hire temporary help who will treat your move like it is just another side job. All our movers are clean-cut student-athletes who have each completed a long and thorough screening and training process before they are able to work on our trucks. Other moving companies might loaf around on the job and then charge you by the hour, but that’s not our style. Not only do we offer fixed pricing plans for long-distance moves, but our Meatheads will also jog to and from the truck when they’re not carrying anything to save you valuable time and money. We have all the equipment, manpower, and expertise to perform long-distance moves, local moves, and even commercial moves. We also offer several other services such as long- and short-term storage, packing services, and our distinctive moving concierge service. We want to make sure your move goes off without a hitch, so if you need any additional help getting ready to leave your old place or setting things up in your new place, let us know and we will refer you to companies and individuals who have earned the Meathead seal of approval. 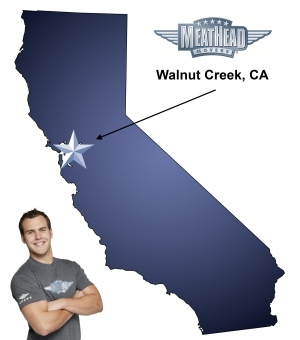 Moving to Walnut Creek won’t be a chore if you choose Meathead Movers. If you are still not convinced, we also offer a 100% satisfaction guarantee. How many other Walnut Creek movers can say they offer that? (Hint: none.) Give us a call today to learn even more about our services or to receive a free, no-pressure moving quote. Moving to Walnut Creek? Here are some helpful resources. View more Walnut Creek resources. Total professionals all the way through the entire moving process. Could not have been happier with the job done! Fast. Easy to book. Straight forward pricing. Dedicated truck. Handled with care. Communicative moving crew. Great work guys. Both loading and unloading, Meathead Movers worked extremely hard, and all were polite, respectful and helpful. Meathead Mover's service was totally professional, pleasant, respectful and diligent! Tanner and Nick worked hard to pack items carefully. They worked hard and wanted to be sure we were satisfied. Outstanding job!! This focus on a strong display of your customer service standard seemed a little overkill at first glance, but, of course, it turns out that this move was more stressful than I anticipated and I NEED-NEED-NEEDED that. Those boys were like cool running water. Promt, efficient, courteous, organized, very professional. Able to accomindate me with one day's notice.